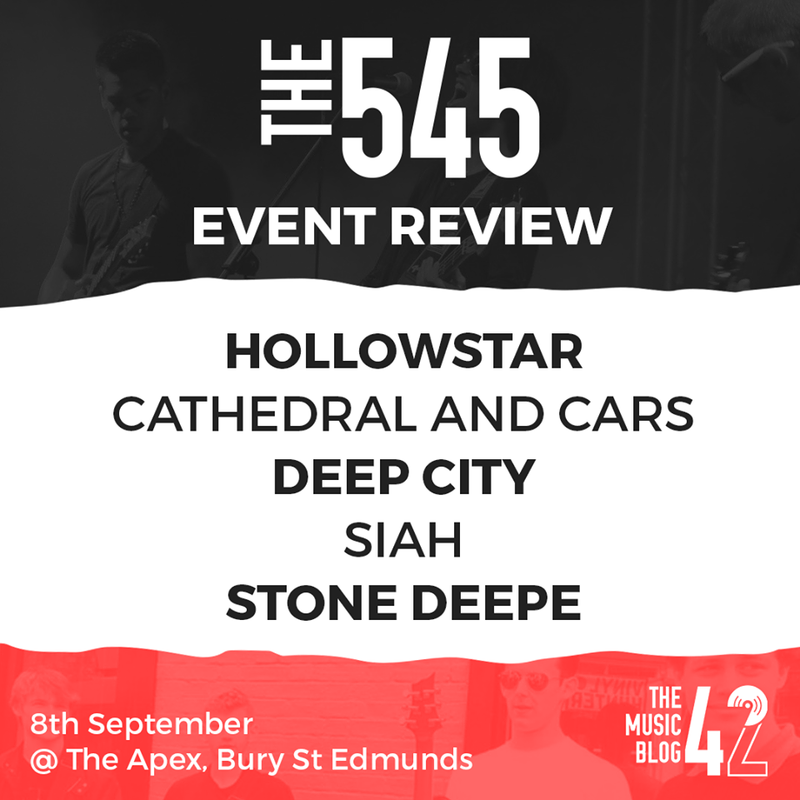 Five of the best bands from in and around East Anglia played an outstanding night at The 545 music event at The Apex in Bury St Edmunds on Friday night. Stone Deepe opened the night with their alternative rock entertaining the growing crowd. If you didn’t turn up early to see these lot, you missed a great set. It was their first time playing in Bury St Edmunds and it certainly won’t be the last. Their setlist was inch-perfect to getting the crowd going, who they thanked for coming. Their set closer Get In Line was a fantastic way to end their inch-perfect set, a proper indie-like sound to it. Next up were the post-punk sounds of one of Bury St Edmunds’ most promising bands SIAH. Although they are relative newcomers to the BSE music scene, they have a great collection of tracks to work with, especially the beautifully-named Feline Friends and the punchy A French Girl featuring “the angellic voice” of their drummer. Susie Smokes is always a great live song and with their debut record out next year, and an already large following, big things await the band. The atmospheric indie-pop of Deep City was up next, and it was just a sign that the night was just going to get better and better. It’s no wonder that they are compared to The 1975 with their track Slow sounding like a blend of some of The 1975’s best songs, absolutely fantastic. The Cambridge-based band wowed the crowd with the even-better swag Wht Hppnd. Deep City premiered a ‘new-ish’ track Classic to the crowd, and if that’s anything to go by, they’re with us for the long haul. Bury St Edmunds stalwarts Cathedrals and Cars were the real highlight of the night with their sophisticated and polished art-rock and a fantastic set which warmed the crowd up for Hollowstar. Notable highlights from their set were the incredible The Concierge and their set closer A Piece of Me Died In Europe. Great songs, great live performance, tonight cemented Cathedrals and Cars as one of the best bands from BSE. Last up were the headliners Hollowstar, from Cambridge. An absolutely electric set which blew the roof off The Apex. They told the crowd they had only been around for about two years, took me by surprise considering how accomplished and confident they were on stage. Their whole set sounded huge, sandwiched by a passionate speech from their frontman about mental illness, that led into the phenomenal Feel The Burn. The band dedicated their new song All I Gotta Say to their loyal fan base. They said comically that without their fans they’d be “at home wanking and playing FIFA”. Sounding absolutely huge, let’s hope they’re back in Bury St Edmunds sooner rather than later! A fantastic event as always at The Apex. I’m already looking forward to next year’s 545!